Awesome awesome game. Brilliant brilliant game. You thought Konami was weird when you saw Solid Snake skateboarding? This is weirder. 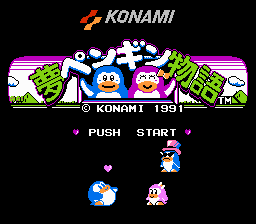 It would be a typical old platformer, except for the fact that you’re a penguin. And, your goal is to lose weight to get back in good with your chicky penguin. And all the bad guys? They throw FOOD at you! So you have to avoid the food cause that makes you get fat and die. Haha, it’s cool even talking about it.